They're what the PADI Advanced Open Water Diver course is all about. And no, you don't have to be "advanced" to take it -- it's designed so you can go straight into it after the PADI Open Water Diver course. The Advanced Open Water Diver course helps you increase your confidence and build your scuba skills so you can become more comfortable in the water. This is a great way to get more dives under your belt while continuing to learn under the supervision of your PADI instructor. This course builds on what you've learned and develops new capabilities by introducing you to new activities and new ways to have fun scuba diving. How to prepare for boat diving - Set up / Entry/Exit of boat etc. Enroll in The PADI E-learning Advanced Open Water Course. This online course will teach about more than 16 types of specialty diving.You'll use this as a guide to improve your diving skills and prepare for new experiences and adventures. Curious about night diving? Flip to the night diving section. Once you've previewed the skills, your instructor will guide you on your first night diving adventure. Having trouble with underwater navigation? 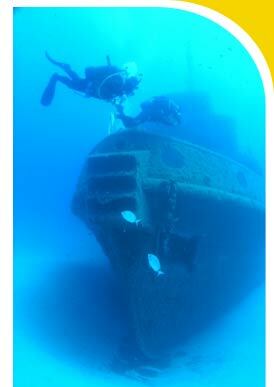 Review the underwater navigation section then sign up for the Navgation Adventure Dive with us. Book your Advanced Open Water Dives with us! This Advanced package includes two boat dives to explore the HMCS Chaudiere. An amazing tour to complete your advanced certification!